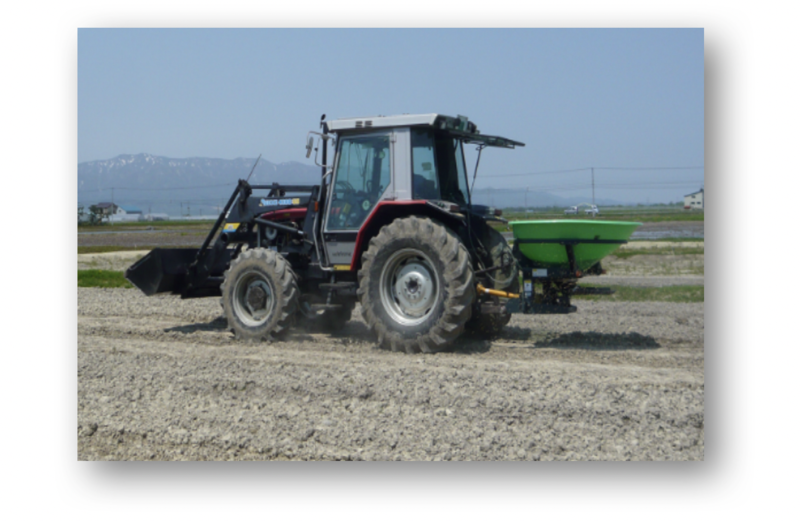 The Lowland Farm Work Mechanization Group is conducting research on cutting-edge labor-saving technology suitable for lowland farm works in Hokkaido. With the expected sharp decrease in the number of farmers in the lowland farm area in the future, it is necessary to establish a labor-saving and cultivation technology system in order to facilitate management of farms that exceed 40 ha per household in order to maintain and expand the agricultural field. Therefore, we are focusing on labor saving particularly during spring time when farm work is at its peak. For efficient farming, we are developing next-generation paddy work technologies combining labor-saving cultivation technology and ICT such as direct sowing of rice by variable rate agricultural materials application using GPS. We are promoting development of broadcast sowing technology which facilitates more labor saving and reduction of in cost of agricultural machinery as compared with the conventional drill sowing in direct sowing of rice paddy. By applying variable rate agricultural material application using GPS, we aim to enhance work efficiency. We are also promoting the development of an automated system of tractor and rice transplanter that allows operation even by unskilled operator using an automatic steering device that follows the target path without operating a steering wheel and enabling work even at night. Paddy in Hokkaido has a high rate of rotation crops area, it is also important to develop rotation crops such as wheat and soybeans in paddy fields and accompanying labor saving technologies. Therefore we will develop labor-saving and stable production technology to efficiently perform fertilization and drainage based on characterization of growth of soybeans and wheat using inexpensive growth sensors. In order to improve the farm management framework, it is desirable to introduce highly profitable new crops. Therefore, in order to contribute to the domestic production expansion of onion which has the largest amount of imports from overseas among vegetables, we are working on the development of automation technology of harvesting equipment such as root cutting and excavation. In addition, we are also developing labor-saving techniques for weeding and harvesting of medicinal crops.